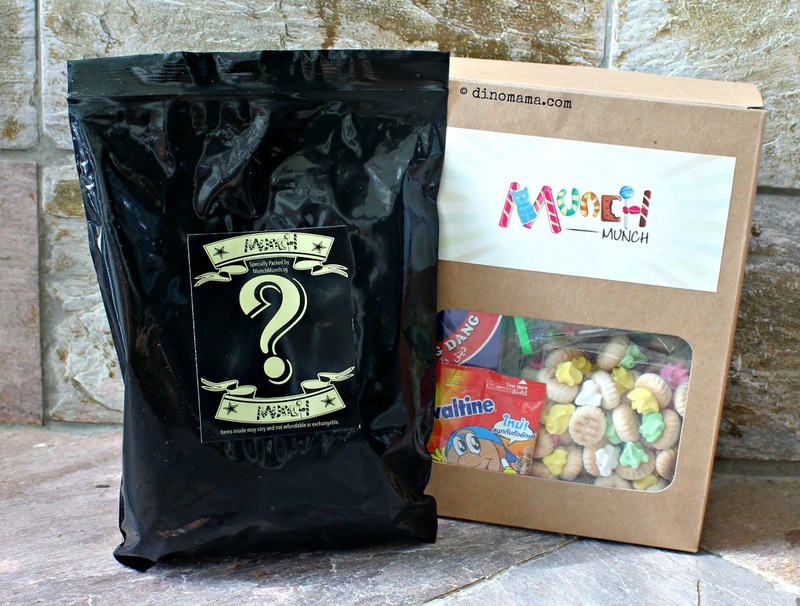 Presenting to you Munch Munch, started by Ken who love every thing old school, it's a place where you can indulgent yourself with the piah, kacang & keropok, tng etc and our personal favourite, the masak-masak and kiam sng tee! What's more, they are pocket friendly too! Oh boy! I'm craving for this now, again! 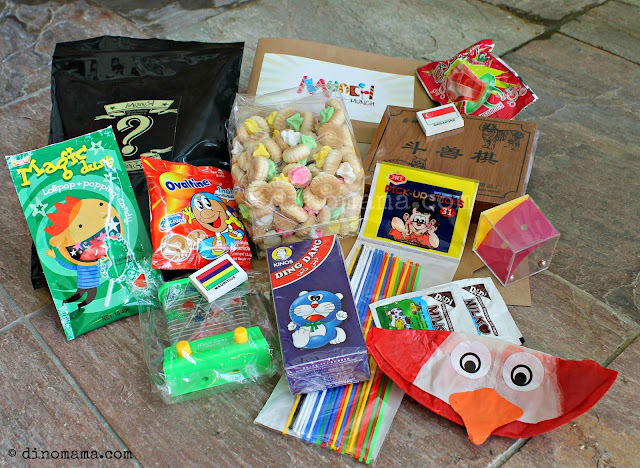 Munch Munch put together a Munch Munch Travel Survival Kit especially for our SG50 Giveaway, so wonderful of them. WooHoo!!! 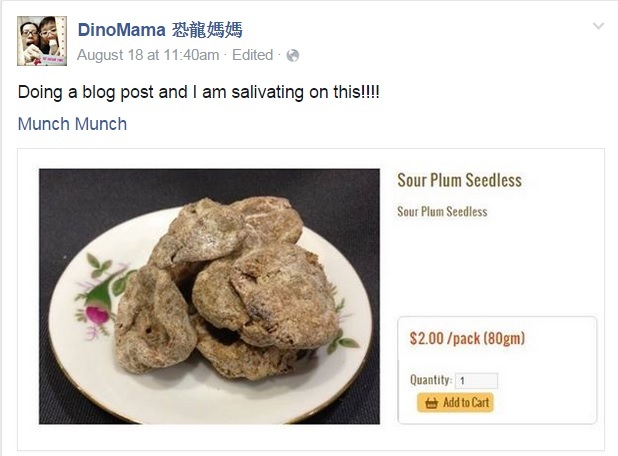 I think it is a great idea because how else can munch on all the snacks all in one go?!! 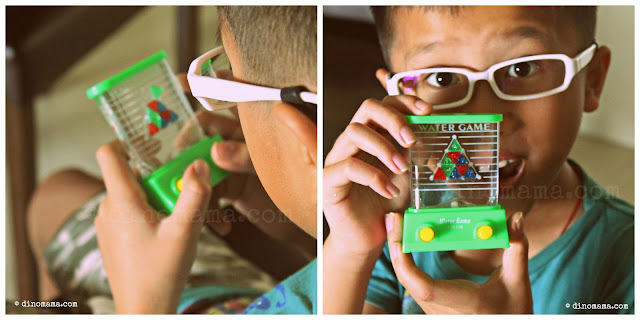 And after we are done enjoying those snacks, we can relive our childhood by playing with those simple but engaging old school games. Oh, you see that black package with a big question mark in the photos? They are the Tikam Tikam Surprise that Munch Munch put together to make this a MORE exciting giveaway. What is Tikam Tikam? Gosh we are so from different era if you are asking that question and that also reveals my age to you *opps* Tikam Tikam means guessing game in Malay language, it is also a popular game in the early years where a cardboard is filled up with tickets with numbers, you can purchase a ticket for a minimal price of 5cents each to reveal the price behind the number. I remembered my Mum sold them in our shop at Bras Basah Complex, it was fun to see the students from the nearby schools came by to buy them and see their expressions when they won the prizes. Look Mum! I managed to get all the triangles in to the hole! DinoBoy always like spinning tops, its obvious coz he made a spinning top out of Lego when he was about 5 years old, so it's not surprise that he love these mini tops. 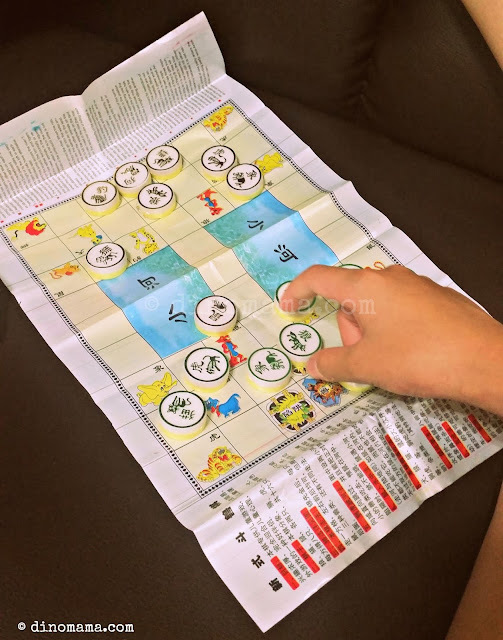 Board and card games plays a big part of our family bonding time, we were thrilled to find Animal Chess included in our Munch Munch Survival Kit! Can't believe that we do not have this yet in our collection. And DinoBoy managed to win DinoPapa in a couple of games, that surprise both DinoPapa and myself. Now I foresee this will be a game that DinoBoy picks first during family game nights. DinoBoy was very intrigued by this simple toy, the Wall Crawling Man he calls it and every time he threw this red little man onto our store room door he's squealing with dramatic words like in the video. A note though, this Crawling Man only moves on our smooth surfaced store room door, he will stick onto our walls AND our ceiling (DinoBoy misfired and the little red man landed above him), refusing to move a single bit. I have already put a whole load of snacks into my shopping cart in Munch Munch online shop, they offers free delivery for orders over SGD100 so that's some savings for me (so that I can buy MOR snacks! YAY!). Excuse me while I go back to my shopping. And if you around these 2 areas below, why not check out Munch Munch? Ok ok! I'm not so evil to keep this goodie stuff to myself, so here's a chance to win a Munch Munch Travel Survival Kit. - Winners will have to collect their prizes from me in Orchard area. Disclaimer : We received a Travel Survival Kit + Tikam Tikam Surprise from Munch Munch for the purpose of this post and giveaway, no other forms of compensation were received. All opinions are 100% ours and all photos in this post unless otherwise credited, are copyrighted and belongs to the DinoFamily, you may not use any of the photos for any purposes without seeking our approval. My old school game would be the string game (The Cat Cradle's game) and Zero Point! My old school games/toys is GAMEBOY!! I love to play that games so much when i was young. I always quarrel with my little sister over it, and who gets to play it first after school. OMG!!!!! Got lot of goodies I missed!!! Wafer Disc.. Satay Stick.. Bob Dog.. Card Game (Donkey & Happy Family my Favourite), ABC Biscuits!!!! I remembered my favourite games are Zero point, Kuti Kuti and five stones that are not found in your picture. Name: Analiza Mokhtar. Always played five stones during school days. That has got to be 5 stones!! I have played hopscotch as well as skipping with my friends during my childhood games.I used to love playing marbles too but they were more popular with boys and I still remember that all our friends had huge collections of marbles of different colors and sizes and sometimes we would trade them too.